Public communication of science is becoming increasingly important for scholars, due both to the awareness that the public must understand science to make informed decisions, and to the importance that funding agencies attach to the dissemination of results. Research groups are using new formats to disseminate information about science and bridge the gap between experts and the lay public. Online popular science videos and social media are useful resources to reach a wide audience and present science in ways that the general public can understand and act on. In this paper, I analyse 15 videos published in the websites of research groups in a Spanish University to determine the strategies used by these research groups to recontextualize scientific discourse into digital videos and engage the lay public. I draw on Hyland’s (2010) concept of “proximity” to explore the rhetorical features that are used to both show the researchers’ authority as experts and meet the audience’s expectations. More specifically, the research attempts to answer the following questions: Which is the rhetorical structure of these videos and how are arguments organised? What roles do visuals play in the construction of arguments and how do they contribute to making the content understandable? How is the credibility and authority of the research group constructed? How is the researchers’ attitude expressed? Which devices are used to engage the reader? Since the online video is a multimodal genre, where several semiotic modes are combined to convey meaning, it is hypothesized that the producers will resort to strategies to construct credibility and engage the audience which are not used in other genres of science popularization. Objectives: As a research-in-progress report, the present paper aims to examine the implications of the notion of “situating” an Academic English course “in the disciplines”. 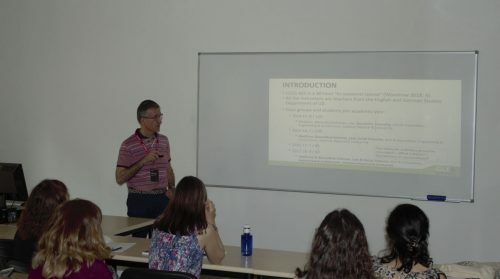 Drawing on an extension of the qualitative methodology discussed in Guillén-Galve (2018), the present study explores the perceptions and experiences of doctoral students and instructors who have participated in the Academic English course at the Graduate School of the University of Zaragoza, Spain, for the last two years. These data are judged to be suitable for needs analysis and competence profiling. The notion of “in the disciplines” is used, for example, in the fact sheet of the Vantage One Program at the University of British Columbia (http://flexible.learning.ubc.ca/case-studies/vantage-college-brings-innovation-to-teaching-international-students/). In UBC, international students with strong academics, but who do not quite meet the university’s English language admission standard, take courses in one of four streams alongside academic English courses in order to accelerate their language learning. Accordingly, as our Academic English course also entails looking into the pedagogical strategies and materials that will prepare Spanish-speaking students “with strong academics” to be ready to meet academic and/or professional demands in English ‘settings’, the main research question in the present study is whether it is possible to establish viable correlations between the students’ disciplines and our findings in terms of needs and competences. For example, are there disciplines that require more work, or special work, on oral skills? Does “situating a course in the disciplines” just mean to take stock of disciplinary content and/or authentic discourse? As is the case with Vantage One, the Academic English course at the Graduate School of UZ has always been divided into “streams” (discipline-based teaching groups), but budget pressure may limit the number of groups. Will literacy and oral skills then have to be cross-disciplinary? Or can they, or some of them, only be subject-specific? Methods and results: As stated above,the present study draws on the qualitative methodology discussed in Guillén-Galve (2018), but now data include the results of a questionnaire as well as semi-structured individual interviews conducted as post-reflections among learners andinstructors from the Academic English course, with a focus on the disciplinary element. The design of the questions is informed by researcher-participant observations and a thematic analysis of the previous survey and the three pilot interviews carried out in May 2017. The analysis of the data is also intended to determine the extent to which a qualitative methodology can help to answer the research question and what can exactly be learnt from the use of a questionnaire and a semi-structured interview. Preliminary results indicate that we may have encountered the “problem of specificity” discussed in Pulverness (2002: 6), and that we should, therefore, stop to consider whether a strict ESAP (English for Specific Academic Purposes) approach is really necessary for the design of the course. Internationalisation links the role of higher education to the process of globalisation and the ability to compete in a global market (European Parliament, 2015). In 1993, Fairclough warned about the “marketization” of university discourse, and about a decade later, Bhatia (2005) noted the incorporation of elements of promotion in academic institutionalised genres. Today, this market-oriented discursive shift clearly emerges in the institutional discourse of European universities with the use of corporate-related terms so that it is common for universities “to talk of themselves as ‘actors’ or ‘players’ on a global higher education ‘market’” (Stier and Börjesson, 2010: 337). This paper focuses on the marketization of higher education institutional discourse (Askehave, 2007; Stier and Börjesson, 2010; Stašková, 2013). It aims to investigate the key themes that internationalised universities recurrently bring to the fore as a part of their institutional identity and with a view to project an image of themselves that renders trustworthiness and credibility among international “student clients”. The investigation draws on textual data gathered from a corpus of websites of ten prestigious European universities. 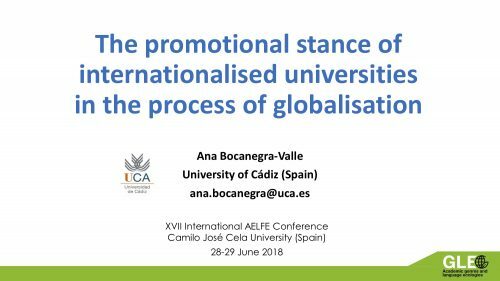 The analysis shows that although common institutional interests emerge across differing higher education contexts, internationalised universities endeavour to address particular student profiles and build unique institutional identities; thus, projecting their own corporate interests onto website institutional discourse.